Titanic: Disaster at Sea is a Scholastic level 3 book, meaning it includes technical vocabulary, maps, and charts for advancing readers. Readers learn about the majesty of the ship that was supposed to be "unsinkable". 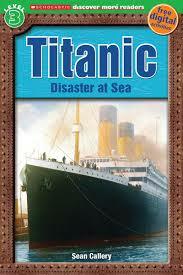 This book includes stories of individuals who were on the ship and lost loved ones in the shipwreck. There is also less-known information included about the robot that was used to find the wrecked ship many years later. The author poses a question for readers at the end of the book... "Could things have been different?". There were a few things that went wrong, but the tragedy could have been avoided. This nonfiction book for young readers, includes an index, glossary, and graphics that make every page exciting! Children unfamiliar with this event might be confused by the way the book starts by explaining a true account of one of the passengers who lost his life in the shipwreck. The "unsink-ability" of the ship is not necessarily known by readers yet. This book includes a code that gives readers access to free digital materials and games, extending their learning beyond the book itself.